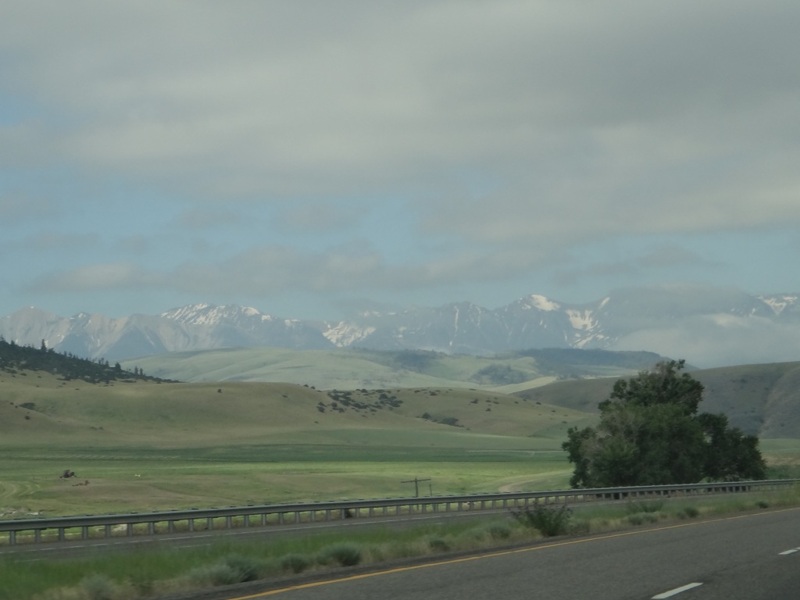 Photograph 1 - Along the I-90 near Bozeman, Montana. Looking towards the Yellowstone National Park ice-cream topped mountains. Photograph 2 – Preparing our lunch at a roadside stream, Wolf Creek, Montana. People were actually fly fishing nearby – they had their “million dollar” equipment and we reckon it would not be easy to catch any fish – the water was only knee-deep and we didn’t see any in the middle of the day. 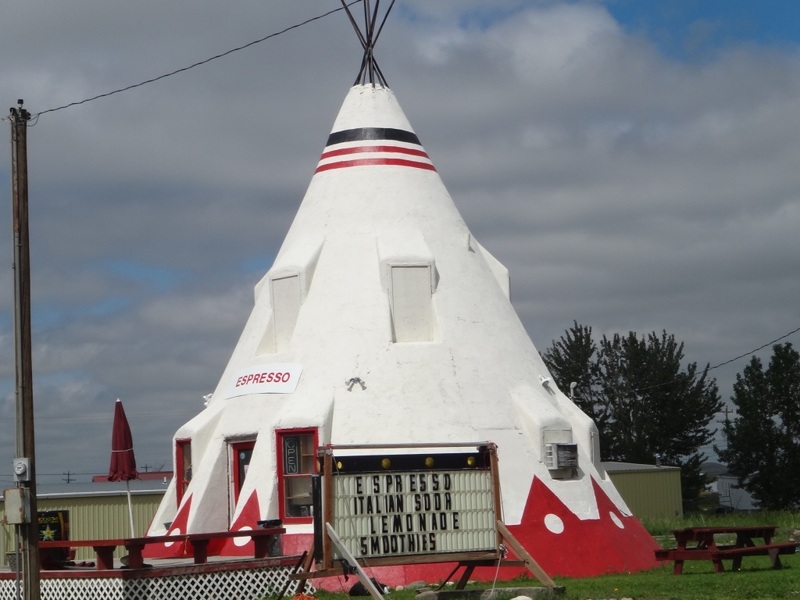 Photograph 3 – The injuns (Blackfeet tribe) at Browning, Montana have really gone modern. Check out their teepee! Photograph 4 – Approaching Glacier National Park, Montana – very close to the Canadian border. 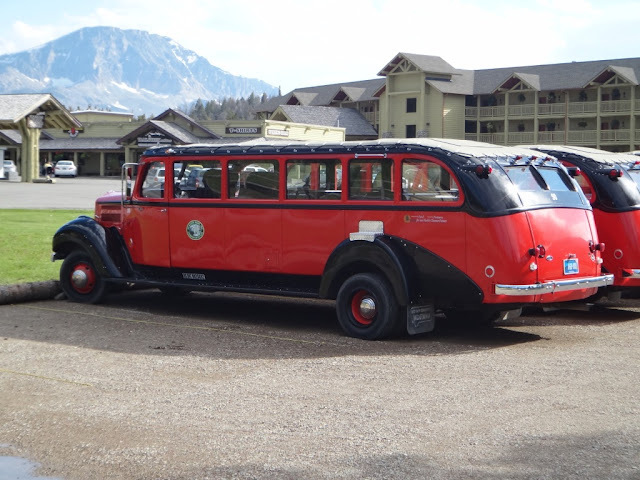 Photograph 5 - Interesting 1935 tourist buses just outside our accommodation, St Mary, Montana - eastern entrance to the Glacier National Park. There is not much to talk about today as it was a road trip directly from Billings to St Mary (yes it doesn’t have a “s” as in St Mary’s) a journey of about 650 klms. We left quiet Billings (being Sunday morning) and hit the I-90 and drove westerly. We did stop at Bozeman when we discovered a Wal-Mart (yes another Wal-Mart) just off Junction 309. Wal-Mart has the best pre-packed lunches and it is cheap. We have found this the best way to not eat fat food at road side diners or take-away joints and naturally, to save money. We usually buy fruit salads and small turkey/cheese wraps. It also a good chance for Neil to buy some cheap runners and deep heat for his feet. Over the past six weeks or so his feet have been quite painful – muscular wise. Onwards we turned off the expressway at Three Forks and headed north towards Montana’s state capitol Helena. 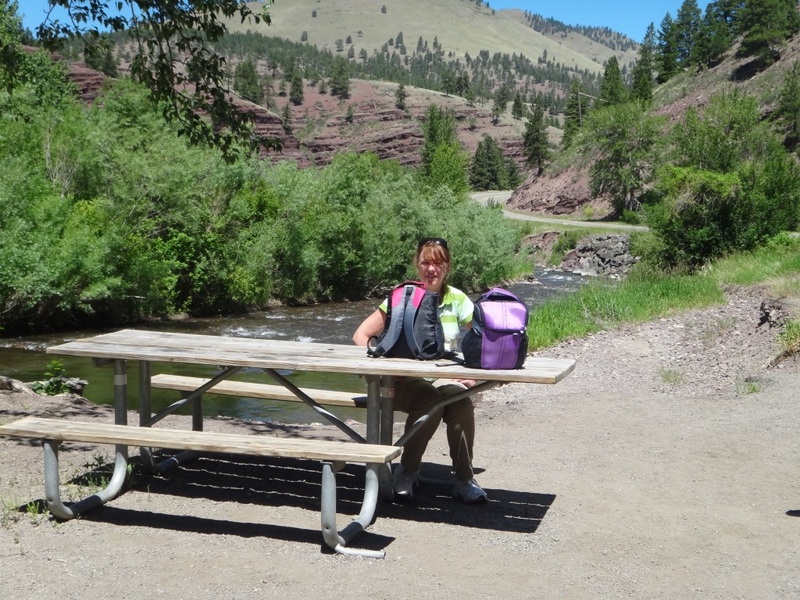 Later we had lunch at a roadside table as we passed through Wolf Creek. After a short repast we kept going north drove through unusual countryside. Montana is a mixture of mountainous ranges however the district we passed through was flat and the land used for wheat growing. There was a sign that said we sow it, grow it and doe it – it was a bakery. We made it to St Mary Lodge at 4:30pm and when we checked in they said there is no Wifi (their confirmation back in Oz did state that there was Wifi in the lobby lounge). Somehow they had unplugged their Wifi because of bad receptions. So…it is a break away from the computer and Wifi for us until we reached Spokane in three days time. We feel that this is a good break. Now about our accommodation – our view from the back door looks over high mountains that have small glaciers and ice pockets. Also we have a mighty stream roaring by only a few metres away. With the door open it is noisy but relaxing. However once the door is shut we cannot hear the water – strange indeed. Our room is reminiscent of a lodge we stayed in Norway back in 2006. That’s all for today. Tomorrow we rest and perhaps take a small drive into the National Park to marvel at their great alpine geological features. Cheers.